As we all know sooner or later every good thing comes to end and this is true with Jio Free Data Offer. Company announces that, post 31st March 2017 Jio will be no more free for its users, those who want to continue to enjoy unlimited data they have to pay for it. Jio announced two types of data plans one for Prime Members and another for Non-Prime Members. In both the plans calls and SMS are totally free. 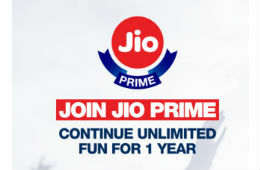 Jio Prime Membership is a scheme in which subscribers get extra data benefits on Jio Plans thought the year. Anyone can become a Jio Prime Member by paying Rs 99 for 1 Year. To become a Jio Prime Member, subscribe this offer either from My Jio App or from Jio.com website before 31st March 2017. You can also visit your nearest Jio Store to avail the Plan. Let's discuss the Jio Plans after 31st March and extra benefits for Jio Prime subscribers. Unlimited Local, STD Calling & Free Roaming facility is available in all plans for both Prime & Prime Subscribers. This is a Basic Plan Valid For One Day Only. In this Plan, Non-Prime Members will get 100MB Data & Prime Subscribers will get 200MB data. Unlimited SMS facility is available for all members. This Plan offers 300MB Data & comes with 3 days valid & those who are Jio Prime Subscribers, they will get 600MP Data. Unlimited Local, STD Calling, Unlimited SMS & Free Roaming facility is available for all members. This Plan comes with 7 days validity period. Under this plan, data benefits are of 600MB is applicable but Prime Subscribers will get huge benefits. Jio Prime Subscribers will get 7GB of data with daily Fair Usage Policy (FUP) Limit of 1GB is Applicable. After 1GB the speed is reduced to 128KB. Every night After 12 AM the speed automatically moves back to 4G Speed. This Plan is such that was recently highlighted by Reliance Industry Chairman Mukesh Ambani itself. This pack offers 28 days validity, 2.5GB data for Non-Prime Subscribers & unlimited data for Prime Subscribers with a daily FUP Limit of 1GB.After 1GB the speed is reduced to 128KB. Every night After 12 AM the speed automatically moves back to 4G Speed. This Plan is for those who don't want any kind of daily FUP cutoff. In Rs 999 subscribers will get 12.5GB of data without any daily maximum usage restriction within 28 days of validity. There is lots more in store for Prime Members. Prime Subscribers can avail 60GB of high-speed 4G data with no FUP limit and double validity period. Yes, Validity Period of this plan is 60days for Prime Subscribers. This Plan is suitable for High Data users. 28 days validity, 30GB data without any FUP Limit for normal customers & for Prime Customers 90 days validity, unlimited high-speed 4G data but with a twist. Actually, Jio enforced a limit of high speed 125GB 4G data after this the speed is reduced to 128Kbps, also unlike, other plans, once the limit of 125GB is exhausted this speed won't restore after midnight until you recharge again. By paying Rs 4,999 normal customers will get 28 days validity, 100GB of data & Prime Members will enjoy 180 days validity with 350GB data benefits at 4G Speed. After 350GB speed downgrade to 128Kbps. This is the last Plan that offers 200GB of data & 28 days validity for Normal Customers. Validity Period for Prime Members is 360 days with limited high-speed 4G data benefits upto 750GB. Post 750GB speed downgrade to 128Kbps until next recharge.